Are you active on multiple social platforms? Are you using your Facebook page to grow followings on other platforms? 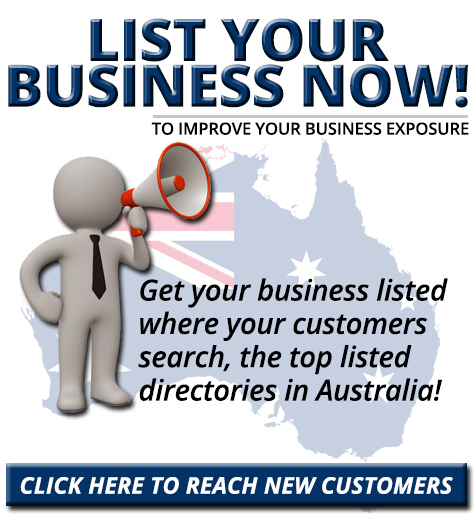 Promoting links to all your social profiles on Facebook lets your fans know where else they can find you. In this article you’ll discover six ways to promote your social profiles on your Facebook page. Thanks to Andrea Vahl for writing this article. Read on. 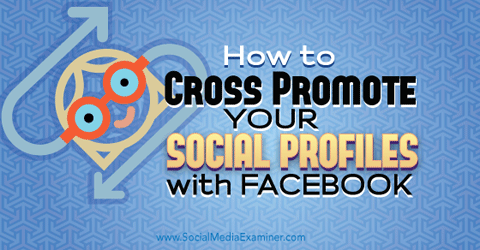 Discover how to cross promote your social profiles with Facebook. 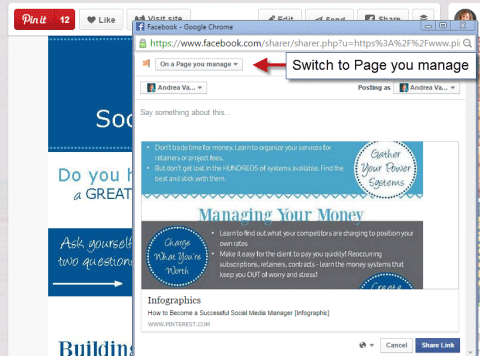 You can add links to social sites in the About section of your Facebook page. Add them to any part of your description where they fit. 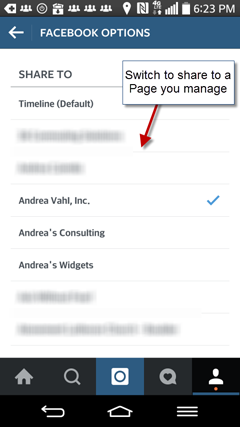 If you include a link in your short description, it shows up in the About area of your main Facebook timeline. 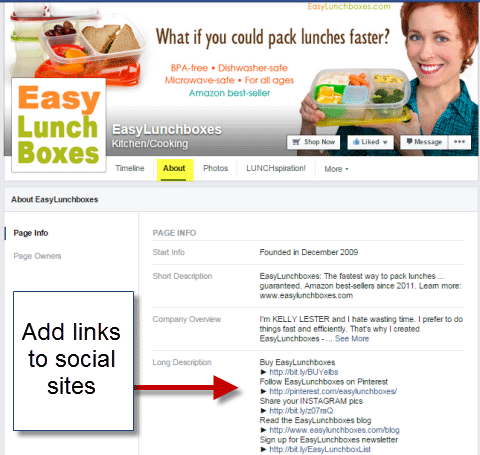 On the EasyLunchboxes page, special arrow characters highlight the social links. If you want to use these characters in your About section, just copy and paste them from another site. 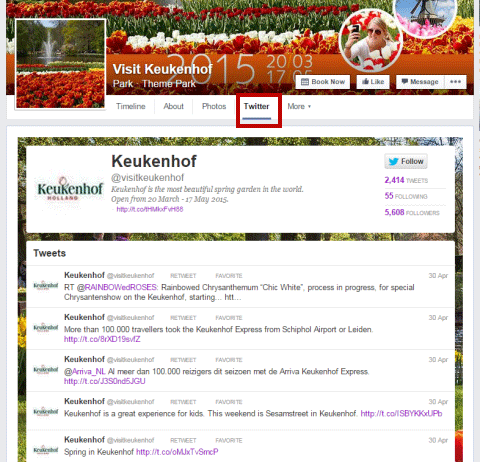 Add links to social sites in the About section. Your cover photo description is one of the most underutilized places for text and links. When someone clicks on your cover photo, they see the full description of the photo, so you can add anything there you want to promote. List your social sites links in the description area of your cover photo. While this may not bring you hundreds of new followers on all of your social profiles, it’s such a quick and painless edit, why wouldn’t you take 10 seconds to do a little cross-promotion? Adding a Facebook app to your page, also known as a tab, can be a great way to show visitors your other social media profiles. Third parties (not Facebook) develop these apps and they all work slightly differently. There are many more apps that can also help you with adding a custom tab to your page. Your apps can also appear in the left sidebar of your timeline, and you can customize the thumbnail so it matches your branding. 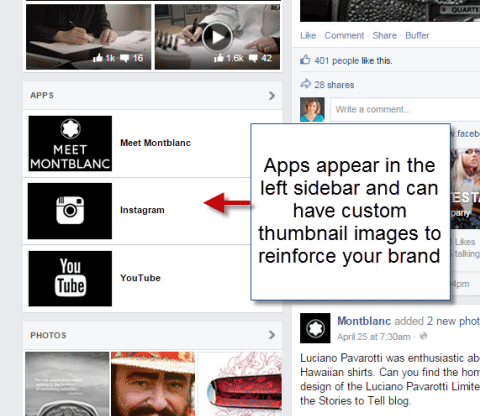 The top three apps on your page appear in the left sidebar and can have custom thumbnails. One of the benefits of adding your social site links to your page is that people can easily follow you from the tab and see your activity. The first app listed also appears just under your cover photo. 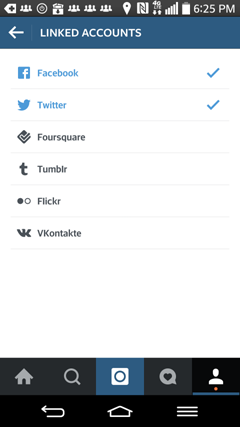 Your social tabs are automatically updated with your latest posts. Remember that mobile users can’t see your tabs on their phones, so if you include a link to your tab, make sure it’s “mobile-ready.” This means it has a special link that identifies when users are on a mobile device and takes them to a separate site that shows your tab content. You can put together a Facebook album with icons from your social channels and include social links in the photo descriptions. When you initially share this album, your followers will see it, and you can always reshare a link to the album as a fun way for people to see your profiles on other social sites. Use all of the social icons as images in a photo album. The benefit of putting the photos in an album is that they’re a little more visible than a single image that gets pushed down in your uploads as you add more pictures. 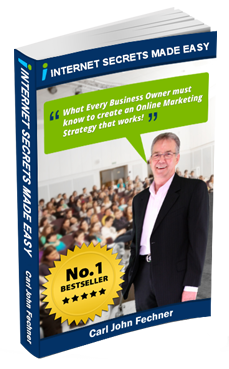 In the photo description, add the link to your social site. Sharing content from other channels with your Facebook page helps you cross-promote all of your social profiles and makes it easier to post content in multiple places. But always remember the true goal. If you’re really trying to drive traffic to a blog post, for example, it doesn’t make sense to share the tweet of the pin of the blog post to Facebook. It would take someone too many clicks to get there. But some occasional sharing from your profiles on other social sites helps draw attention to those channels. If you have share buttons, sharing content from your other social profiles with your Facebook page is usually just a matter of switching the destination to your page. Sharing from another social site to your page is usually just about switching the destination. 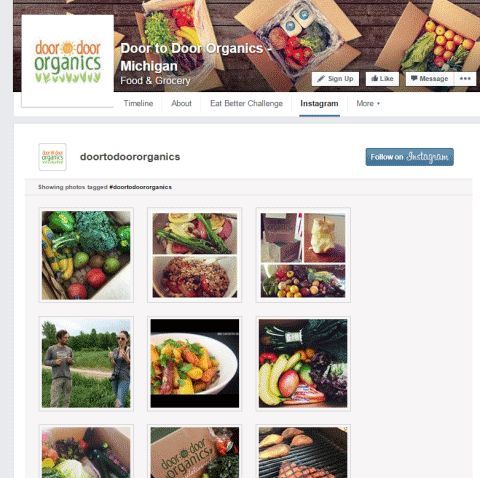 On Instagram, sharing your posts with your Facebook page is a matter of changing your settings. By default, Instagram shares images with your personal profile when you connect Facebook to your Instagram account. To change the sharing destination of Instagram images from your Facebook profile to your page, open the Instagram app and go to Settings (the three dots in the upper-right corner when you’re looking at your profile). Then tap Linked Accounts. 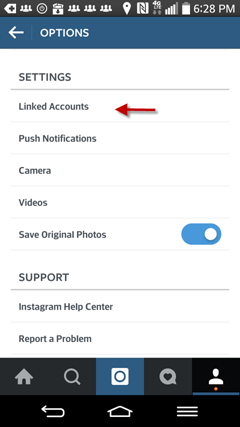 Change your Instagram settings on your mobile device. Now tap Facebook to make changes to the destination. Tap Facebook to make changes to your Facebook destination. Edit where you want your Instagram photos to go when you tap Share to Facebook. You can select a page to send your photos to instead of your personal profile. If you only want some photos to go to your Facebook page, you have to manually change this setting before sharing. Or you can set up a workaround such as an IFTTT recipe (discussed in the next section) to send only some images to your Facebook page. A little automation can be good. While it’s a great idea to post natively to social sites so you can upload properly sized photos or tweak the language to fit the site, sometimes it’s handy to post to several of your profiles with the click of one button. Send all of your Facebook page posts to Twitter by connecting them here. This option isn’t recommended for everyone, as your posts get cut off at 140 characters (with a link back to the original Facebook post) and you may not want every post to go to Twitter. Use tools to post to several profiles at once. These tools allow you to craft your post and then select which social profiles it will go to. Many of the tools have other features as well, such as analytics, special scheduling and team management. 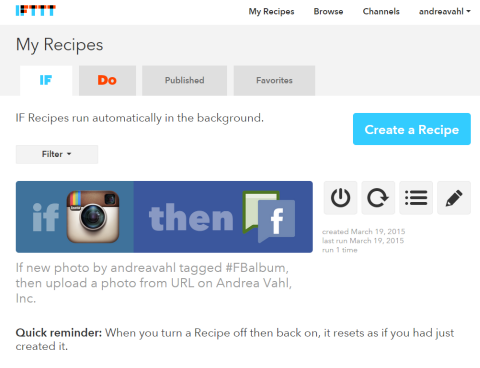 Use IFTTT to create rules around a type of post or share that you want to automate. For example, if you want to put some images for an event in a special Facebook album, you can create a recipe to automate the process. Use IFTTT to create special rules around social sites and sharing. By making others aware of your Facebook page and connecting in multiple places with people, your messages are more likely to be seen. Think of your own browsing habits and how often you see messages in all places at once. If you’re anything like me, it’s probably not that often. So don’t worry about overwhelming your audience with the same messages if you post in multiple places. I find that most businesses err on the side of not promoting their other social real estate often enough. Make sure you’re using some of these tips to get the word out about your other social channels. How about you? Are you cross-promoting links to all your social media profiles? What is working best for you? Share your thoughts in the comments below.